Our new review on the how hypoxia is important in cancer-associated bone disease has just been published in Calcified Tissue International. What is Hypoxia and why is it important in cancer? This entry was posted in Articles, Research Publications, Reviews on November 6, 2017 by Matrix and Metastasis. This entry was posted in Breast Cancer, Research Publications, Reviews on October 18, 2016 by Matrix and Metastasis. 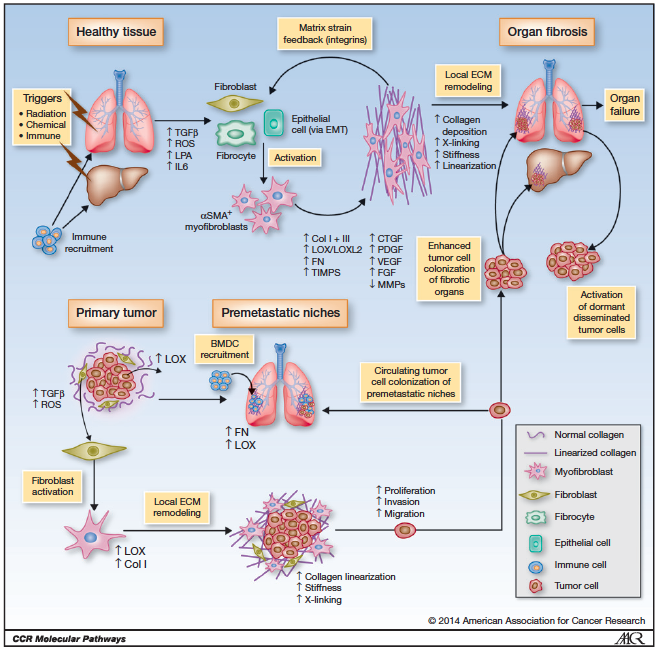 Targeting the Extracellular Matrix (ECM) in Pancreatic Ductal Adenocarcinoma (PDAC). What is cancer associated fibrosis? This entry was posted in Pancreatic Cancer, Research Publications, Reviews on June 1, 2016 by Matrix and Metastasis. Over the last 2 decades there has been a rapidly increasing number of research papers published (many from our own lab) investigating the function and role of a secreted enzyme called Lysyl Oxidase (LOX). Each paper has added successive small pieces to the complex puzzle of what exactly LOX does in both normal development and human disease, none less so than cancer. This entry was posted in Research Publications, Reviews on January 8, 2016 by Matrix and Metastasis. My recent editorial piece on ‘Fibrosis, cancer and the pre-metastatic niche’ has recently been published in Breast Cancer Management. This entry was posted in Breast Cancer, Research Publications, Reviews on October 6, 2014 by Matrix and Metastasis. My recent review has just been published in the American Journal of Physiology; Gastrointestinal and Liver Physiology. Titled ‘Lysyl oxidase in colorectal cancer’, we discuss the current body of literature on the role of the extracellular matrix remodelling enzyme Lysyl Oxidase in colorectal cancer initiation and progression. Image: The multiple roles of LOX in regulating signaling networks in colorectal cancer, both directly and indirectly. This entry was posted in Colorectal Cancer, Research Publications, Reviews on September 20, 2014 by Matrix and Metastasis. This entry was posted in Research Publications, Reviews on December 5, 2012 by Matrix and Metastasis.